It has been an incredibly busy spring, business-wise and personally. Kids finishing up school, dentist, oral surgeon, orthodontist, emergency surgery… and that’s just kids. Then there was the two emergency speaker engagements and the one planned that I performed, a quick last minute trip with hubby, my own minor surgery and a weekend jaunt to see the folks. I think I can take a breath now. 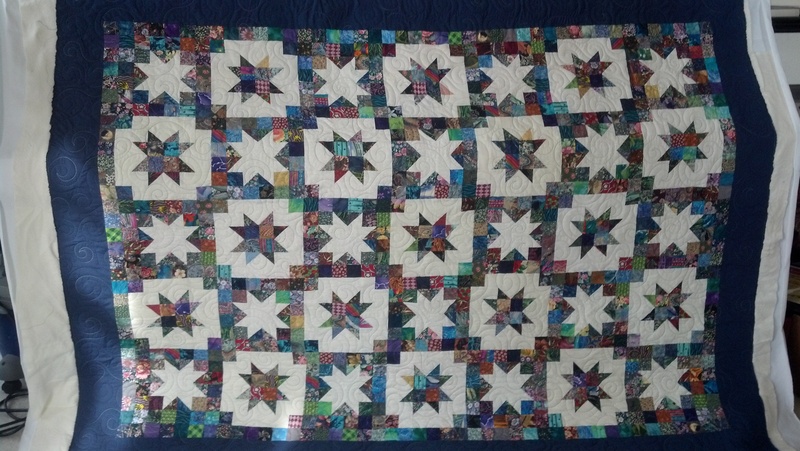 Somehow I actually accomplished a LOT of quilting work, despite everything else going on. 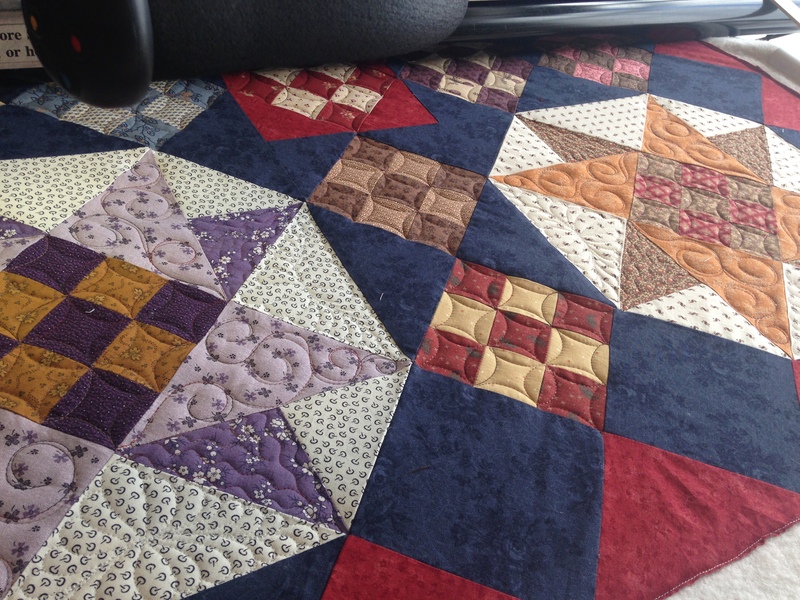 Or maybe because of it – I find quilting so cathartic that it relieves loads of stress for me. It was quite a variety of work, too. 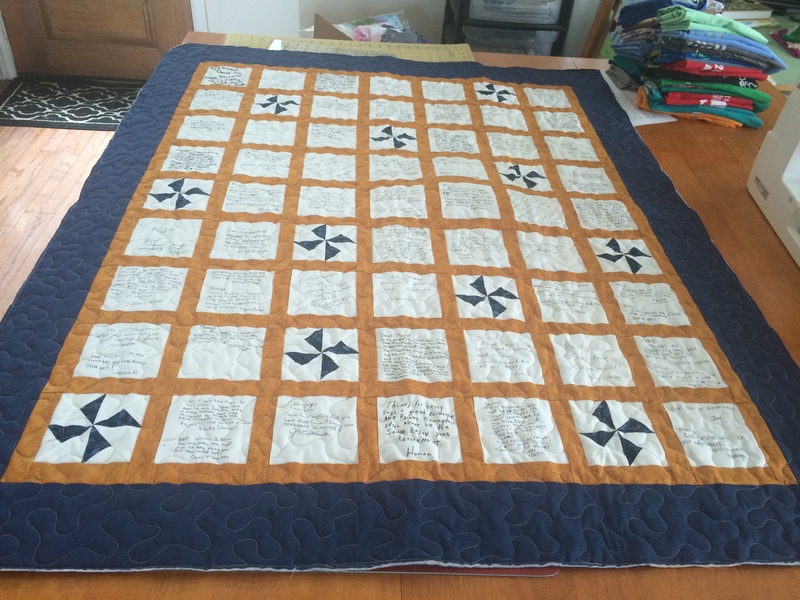 I quilted, bound and appraised a group of antique quilts for a client, made a few t shirt quilts, and quilted whole-cloth hand dyed panels, as well as a few all-over quilts, a custom wedding gift and a few wool applique pieces. 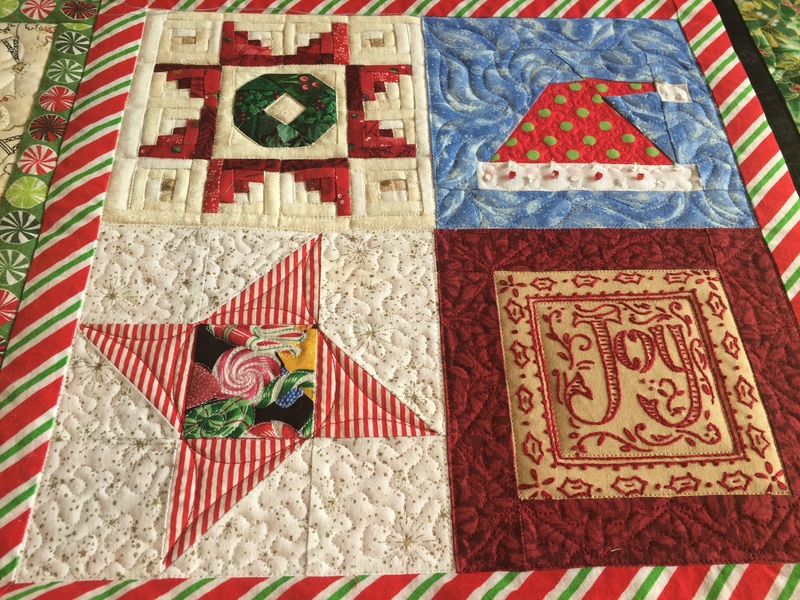 At any rate, I love sharing the photos and as much as I enjoy looking at other quilters’ work, I figure someone out there will enjoy these too! 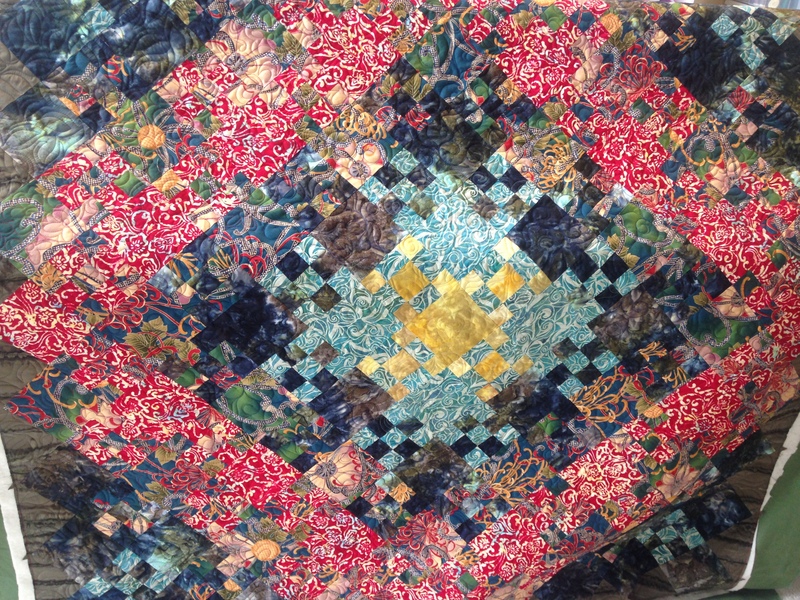 I kept the antique quilts simple; they were going to be auctioned to family at an upcoming reunion. This is one of my favorite old blocks. It’s called Strawberry and it’s not all that common. 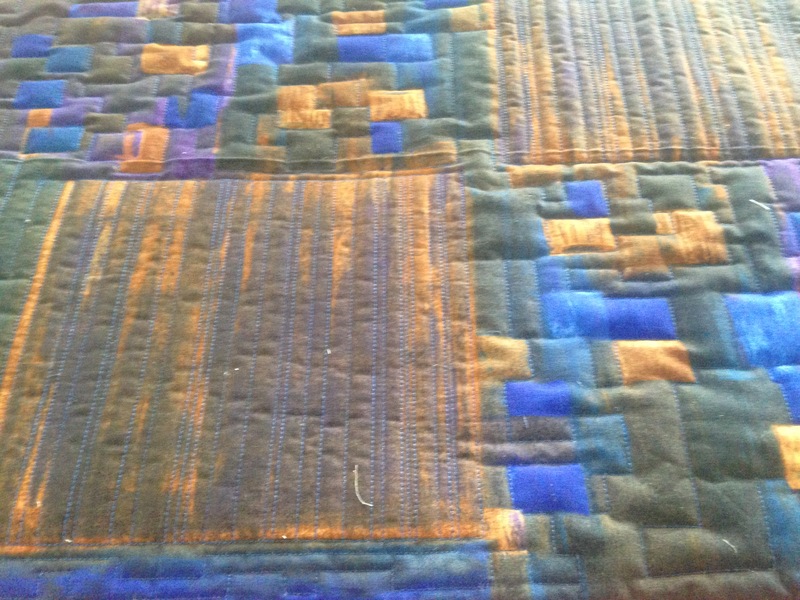 In this case it was beautifully pieced and scrappy but within a specific color framework. This one (above) has a high visual appeal as well. Quite striking. I did this one for a friend. 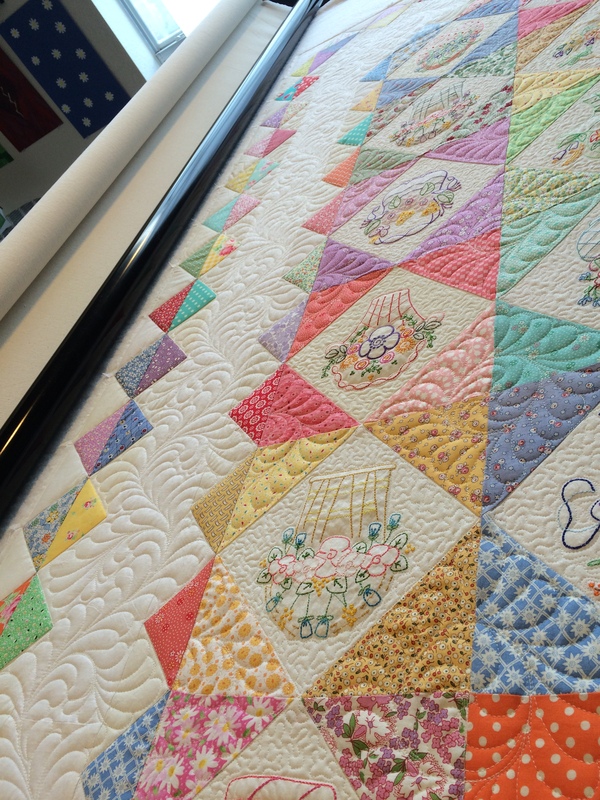 It’s hard to see the overall quilting in ANY of the photos, and a photo of the whole is too far away to get a good idea of the quilting in detail. 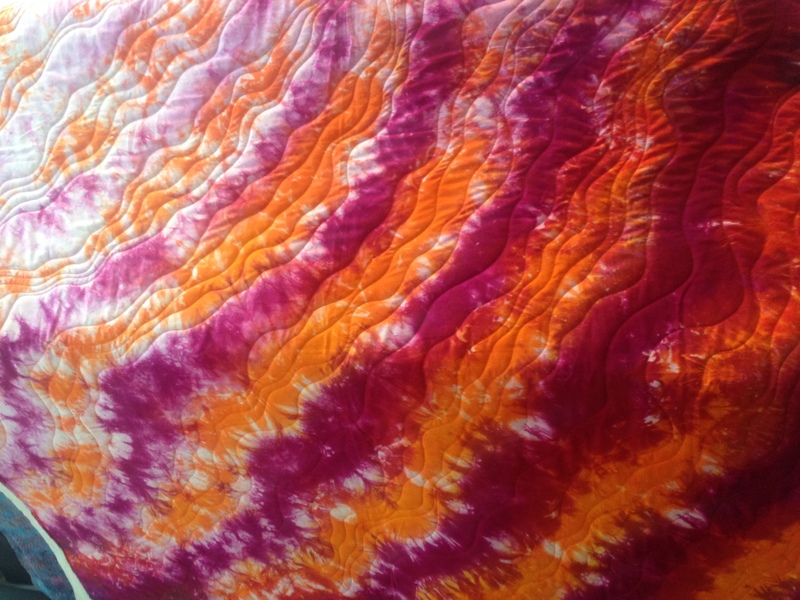 Debra Linker did a beautiful job hand dyeing this panel, and I had fun quilting it. And a little more. 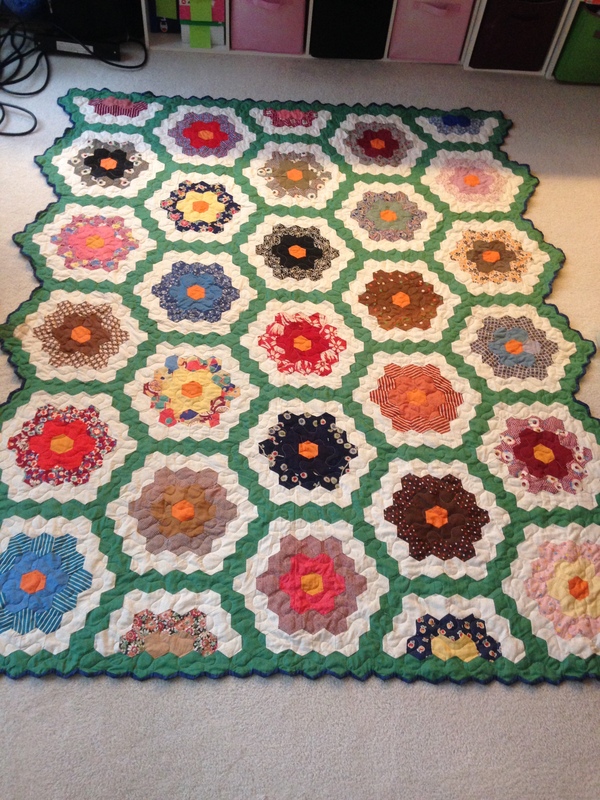 I hope the bride is happy with this gift from her friend – she should well be – it is so beautiful! I can’t even begin to explain how tedious these are, and how pickled I am that they look so straight and evenly spaced! Mind you this is freehand, with my only tools being a tape measure, chalk and my ruler! There were a few others in there. 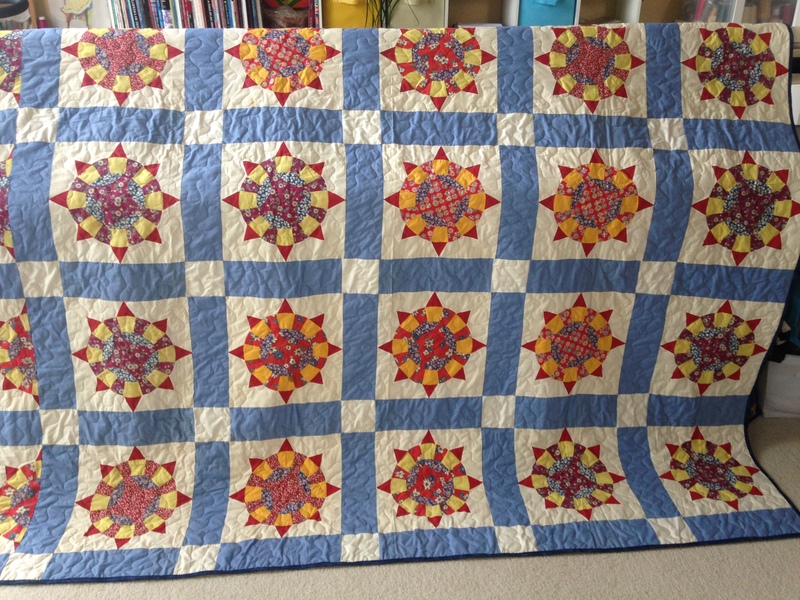 I didn’t snap any pix of the 4 Quilt Of Valor quilts I finished, but after this custom is finished I think I’ll need to do some all over charity quilts to clear my system. I hope my photos have inspired you, or urged you to create something on your own. 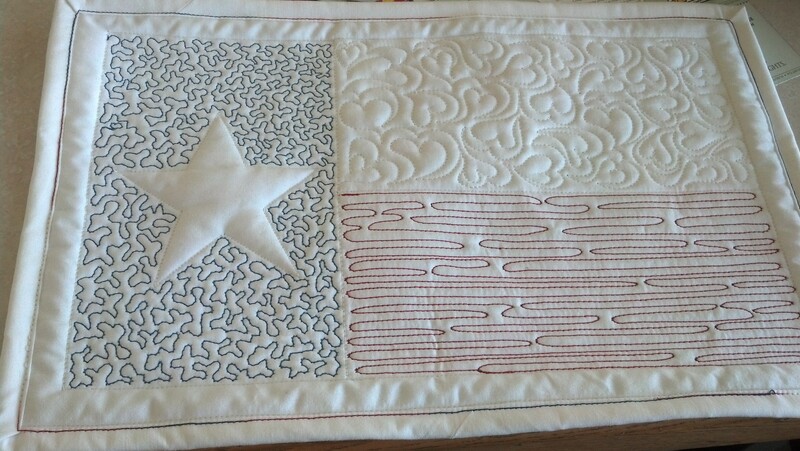 Happy quilting my friends. Stay busy! 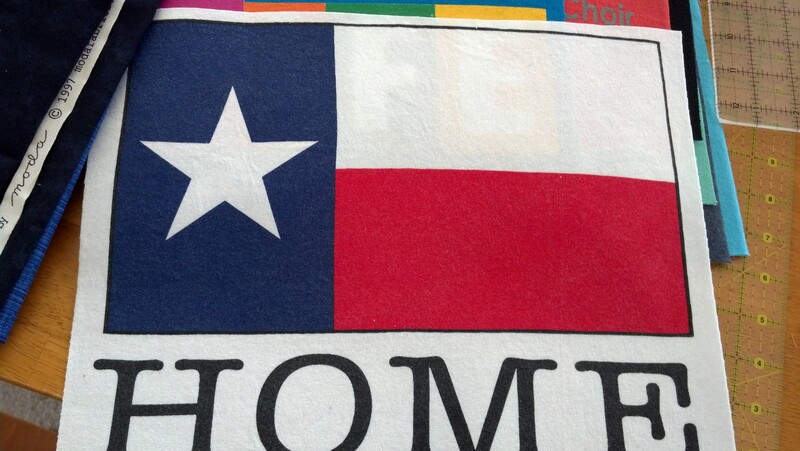 The whole cloth was a mini quilt I gave to someone leaving the state. 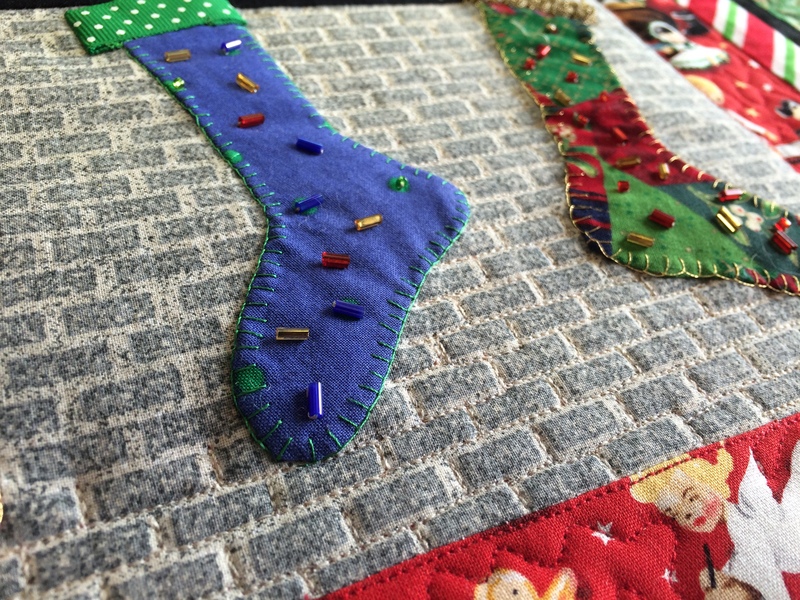 These are great projects to give as gifts or submit for charity auctions. 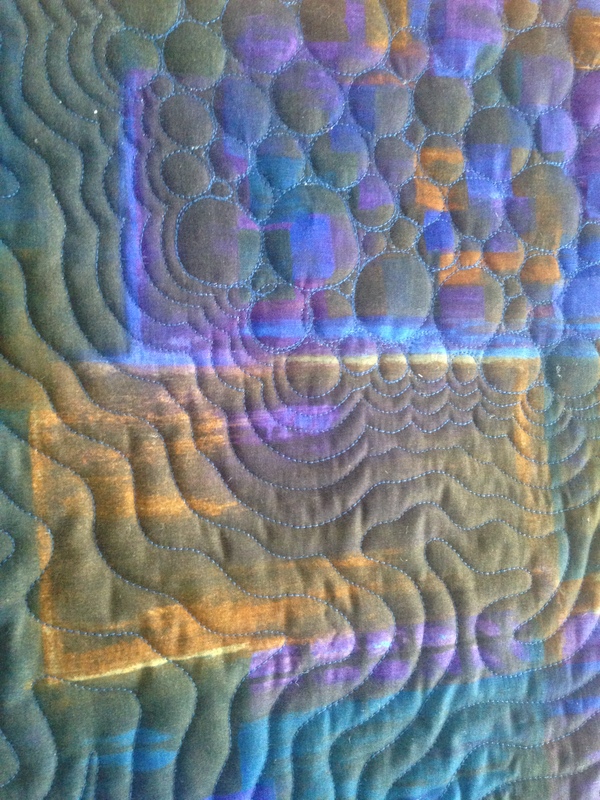 Lately I have also been playing with mini whole cloth quilts made from patterned traditional cotton. 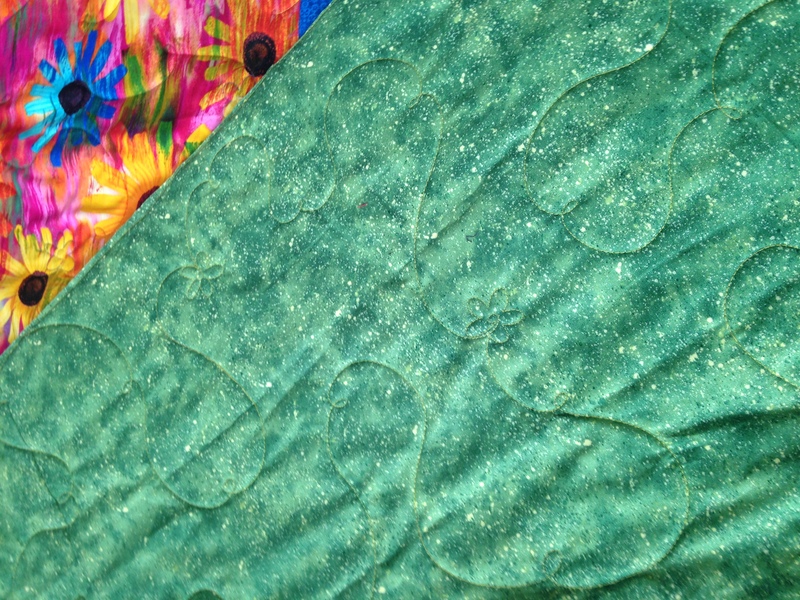 In this case, I quilted three different pieces in different manners, but each inspired by the fabric itself. The one above reminds me of pebbles on a beach and the waves rolling around. On a different piece I went completely linear, versus the curves and softness of the one above. This one just tickles me, but perhaps it’s my odd sense of humor. 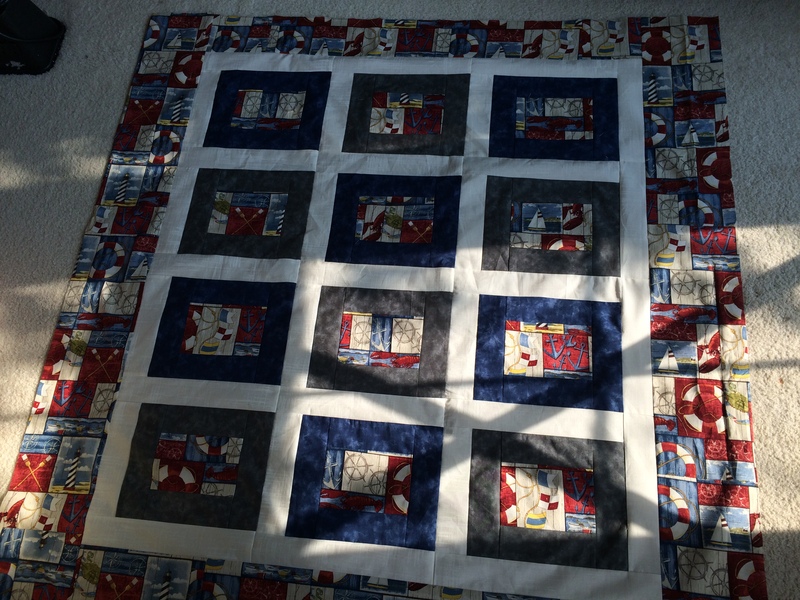 This piece began with me deciding to thread paint a 9 patch alternating block but as I went along, my blocks were not exactly staying the same size. So I started letting them fade off, meaning, not completing the 9 parts of the block – in some spots there are 5 or 6 or 3 of the 9 expected pieces. So the 9 patch blocks sort of trail off. Sometimes you just have to play. 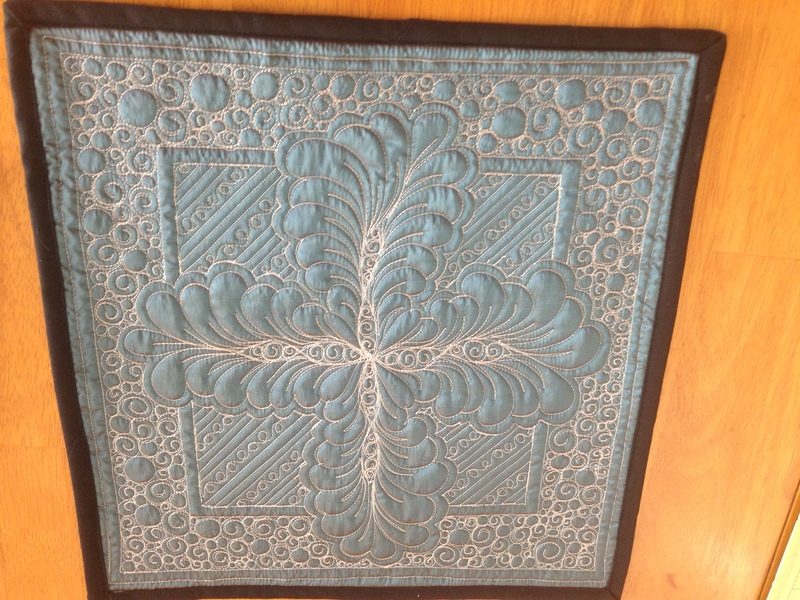 It doesn’t always turn out magnificent, but I figure if I learn along the way, then I have accomplished something, and as a quilter I have made progress towards being better at my craft. 1. What does the customer want to spend? Often I will ask the client if they want an all over design or something more custom. Some say they want to keep it inexpensive, which means all over. 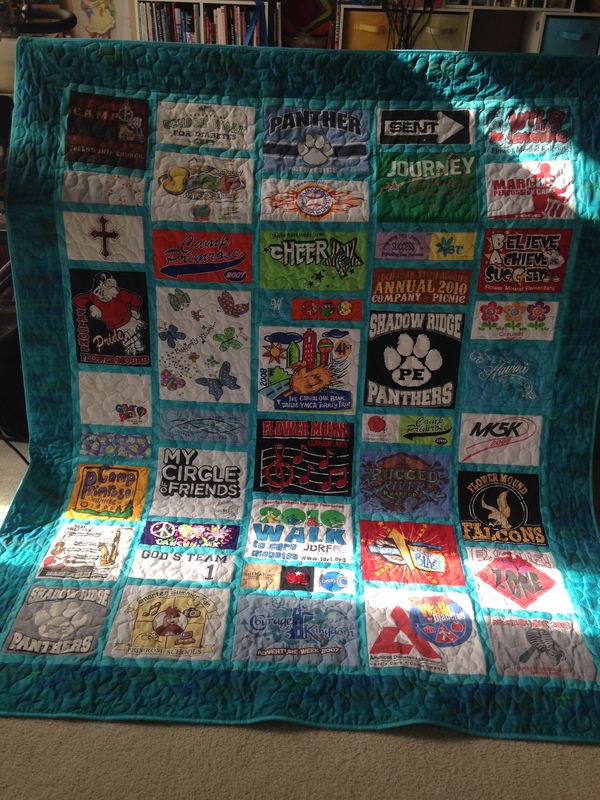 Some say they want it for a quilt show, which generally means more $. 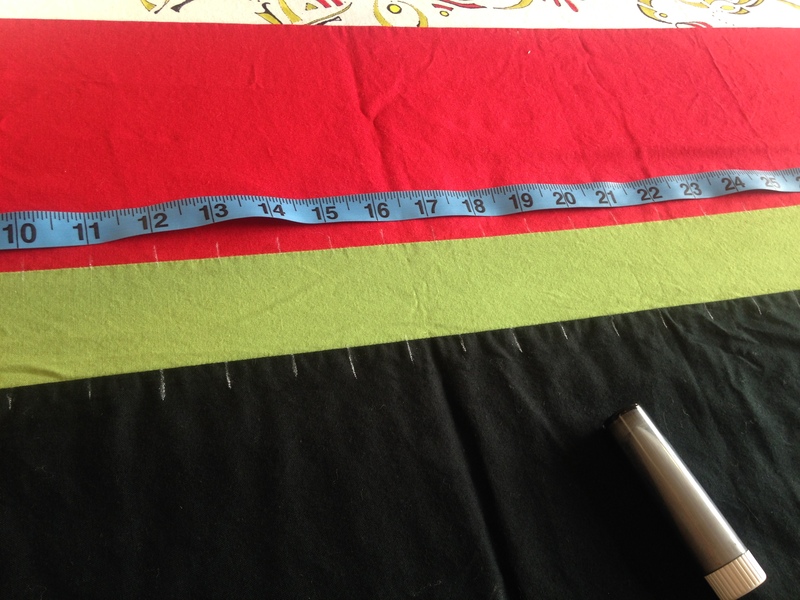 I was working on a quilt today that I gave an estimate for at $0.035 per square inch. 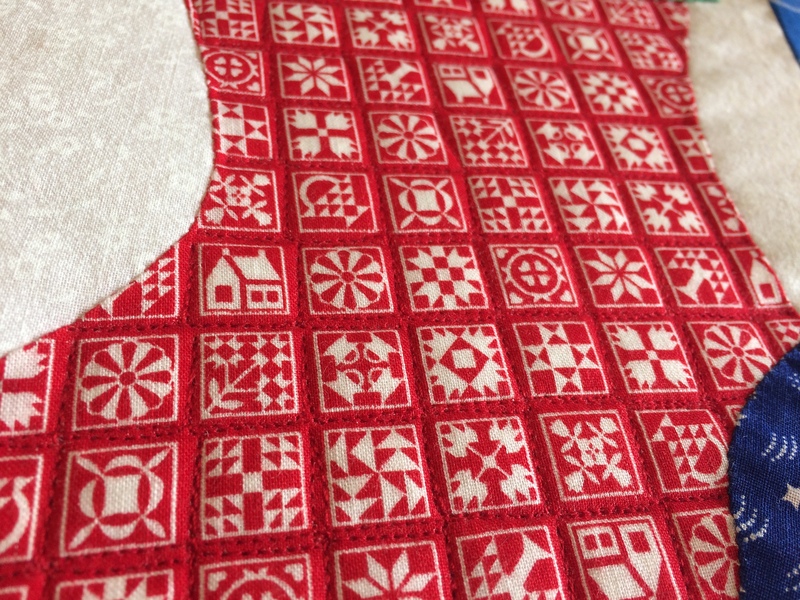 I charge at least 4 cents when straight lines are involved, so that was not going to happen in this quilt. I had to figure out other designs to work in the spaces instead. 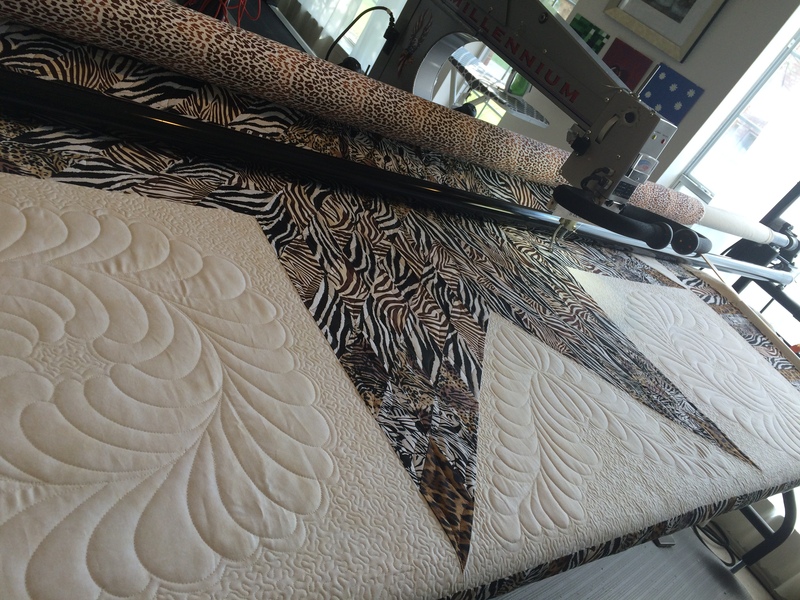 others want more graphic quilting for a modern outcome. 3. What does the fabric say? That is where I often look for inspiration. 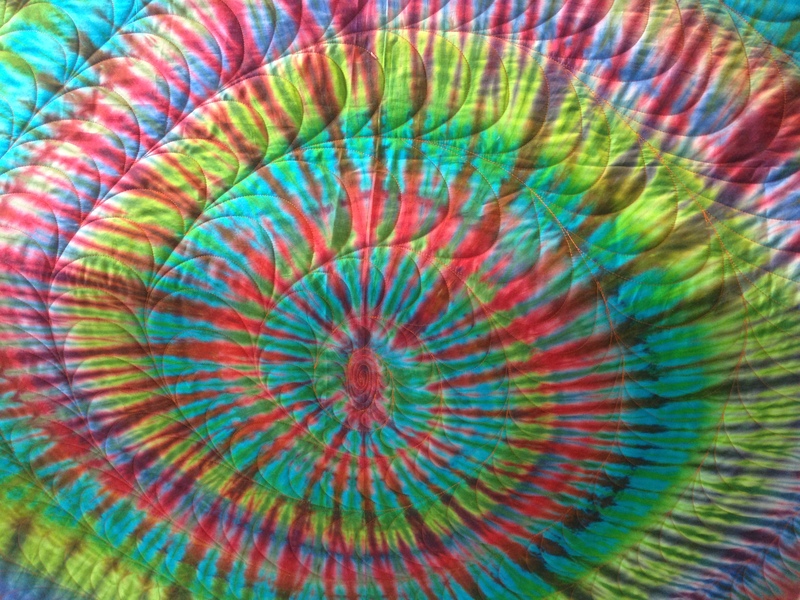 If there are swirls, curls, flowers or circles on the fabric, those patterns induce me to quilt something similar. 4. What does the pattern say? This is really important, even with all over designs. 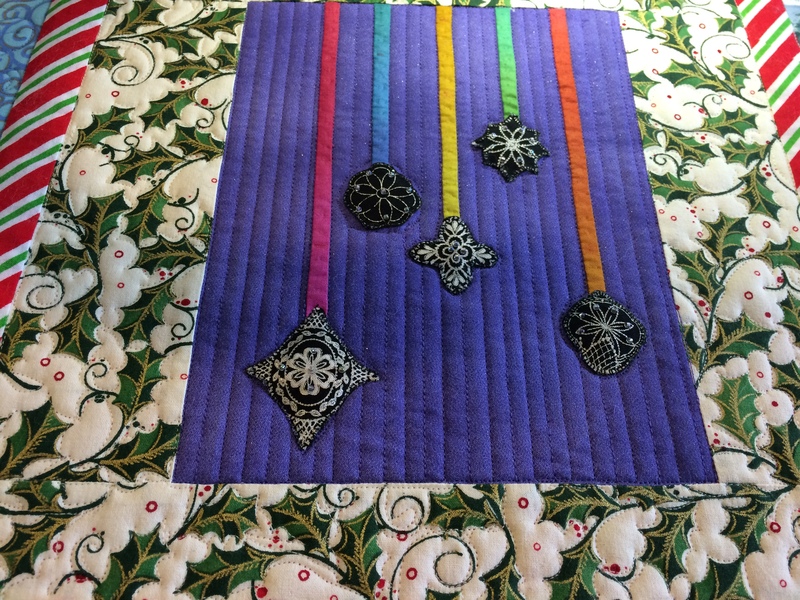 When I receive Quilts Of Valor, they often have star patterns on them. 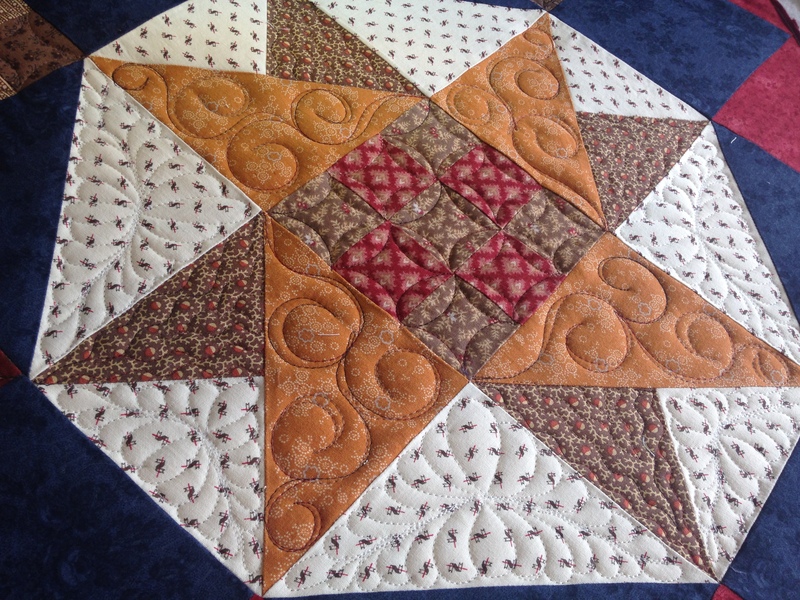 With that type of pattern I quilt in a curvy pattern, so as not to accentuate the sharp angles already present in the pattern. 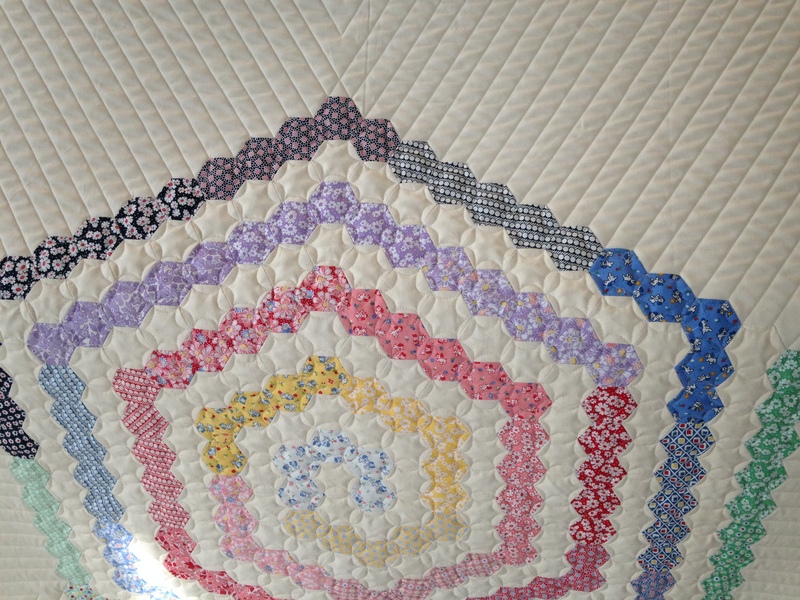 With a custom design, such as today’s project, there are sometimes various blocks that will each be quilted differently. Two things can be exemplified at this point: depth and movement. A. 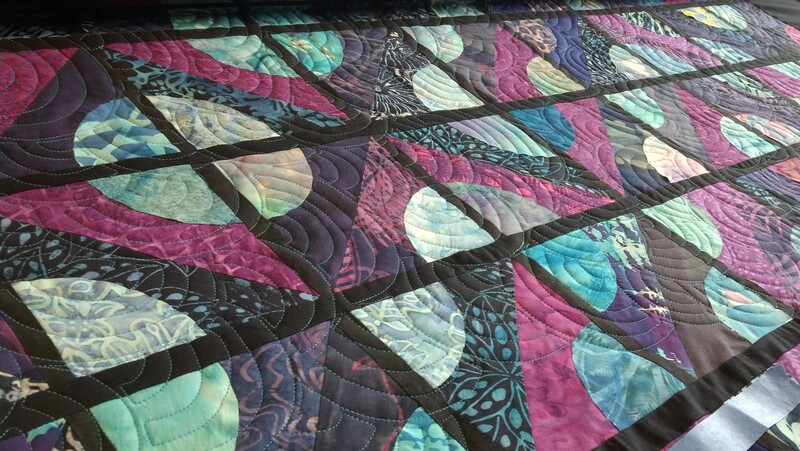 Depth – by quilting at different densities (more quilting in one area than another, such as in the photos below), one can create depth in the quilt surface. 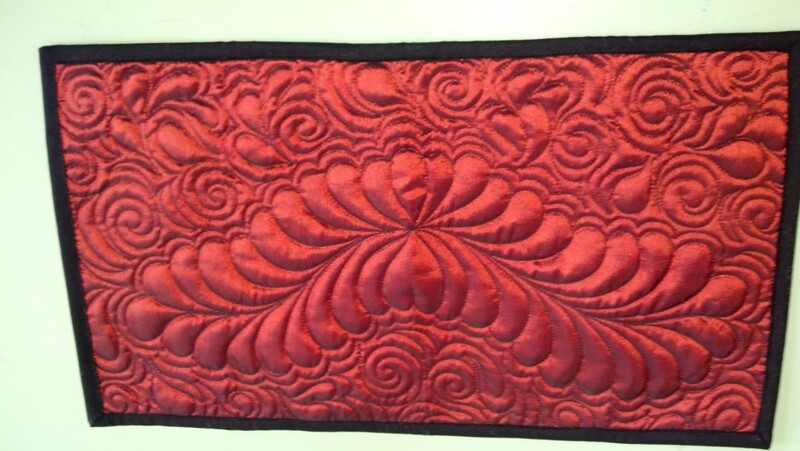 It gives the flat surface more personality aside from the change in quilting pattern. B. 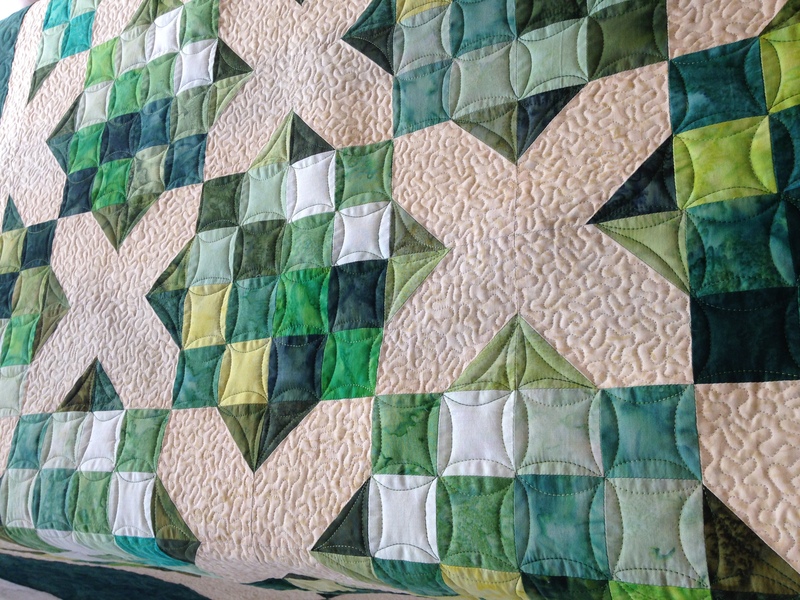 Movement – pinwheels come to mind here, because this block is one that emulates a moving object. 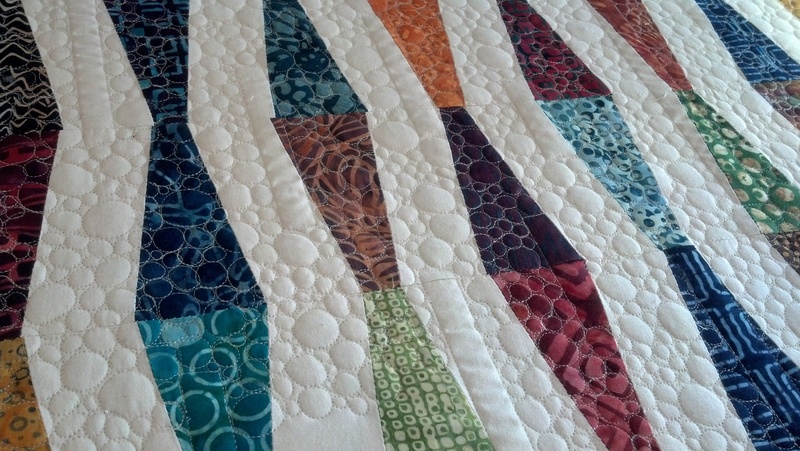 So to quilt it in a fashion that simulates movement also adds visual appeal to the quilt. The pinwheels above showcase this as well as those below. 5. 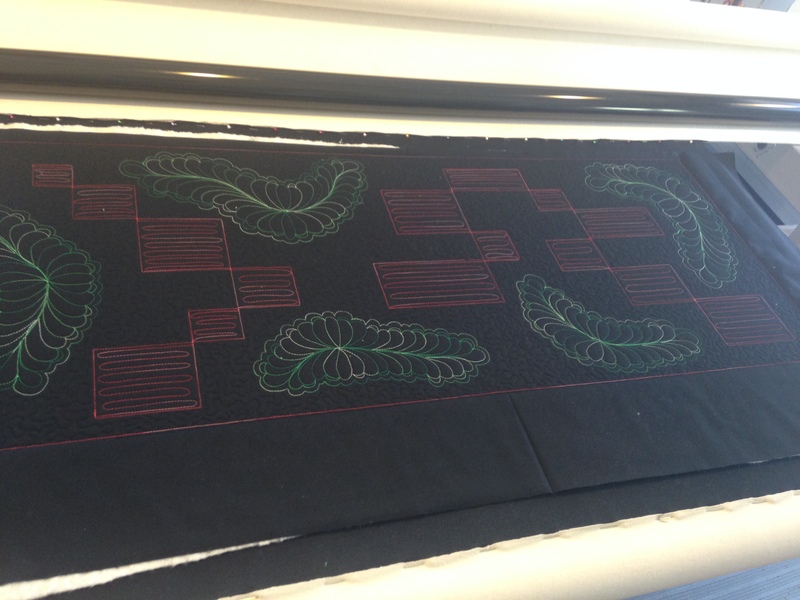 Overall cohesion is INCREDIBLY important to the quilt, and with custom quilts this is where planning comes into play. Using the quilt I was working on today again as the example, I have red triangles inside the quilt as well as along the border. 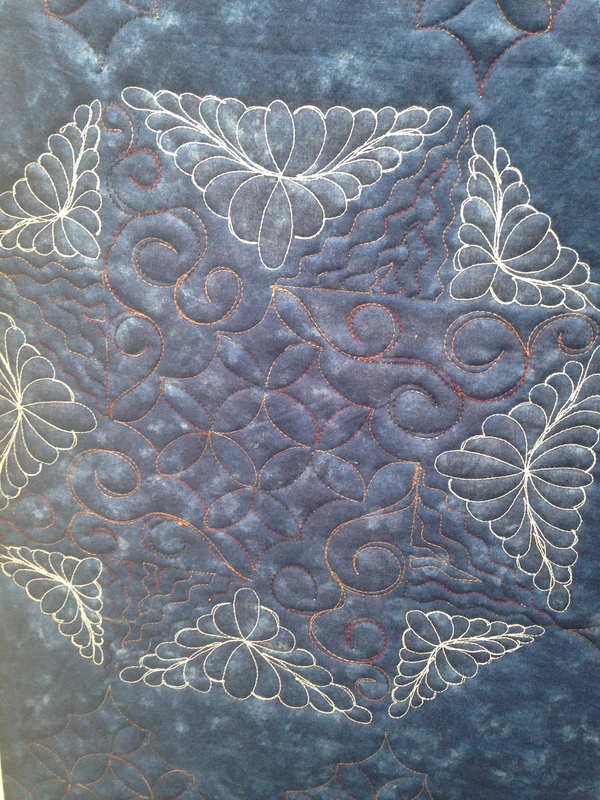 I haven’t quilted either yet because I want them to tie in to one another and haven’t made the final decision as to the design. 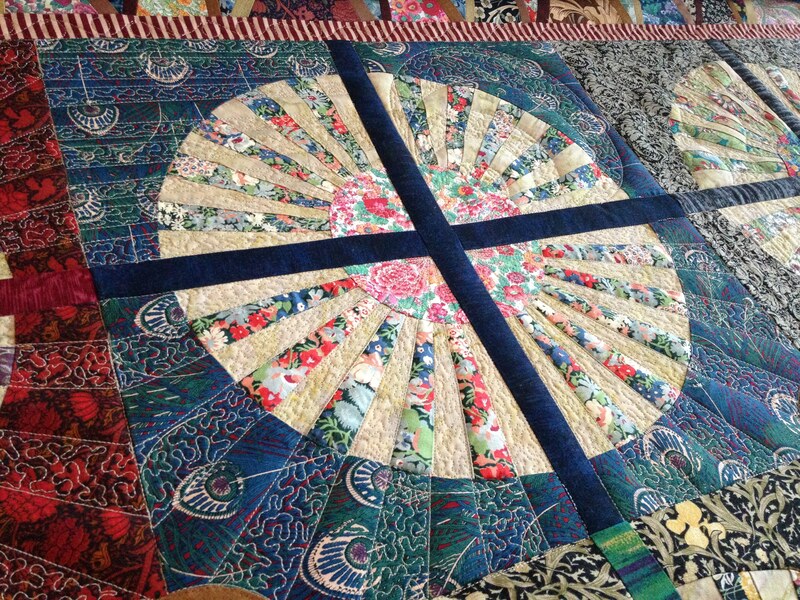 Also, with the pinwheels (the ‘background’ spokes), I wanted to quilt them more densely than the curls on the forefront spokes, and actually tested out a small meander. But it seemed out of place so I removed those stitches and tried the wavy lines, which I felt added the movement in the photo above. I may end up using wavy lines in the red spaces as well. 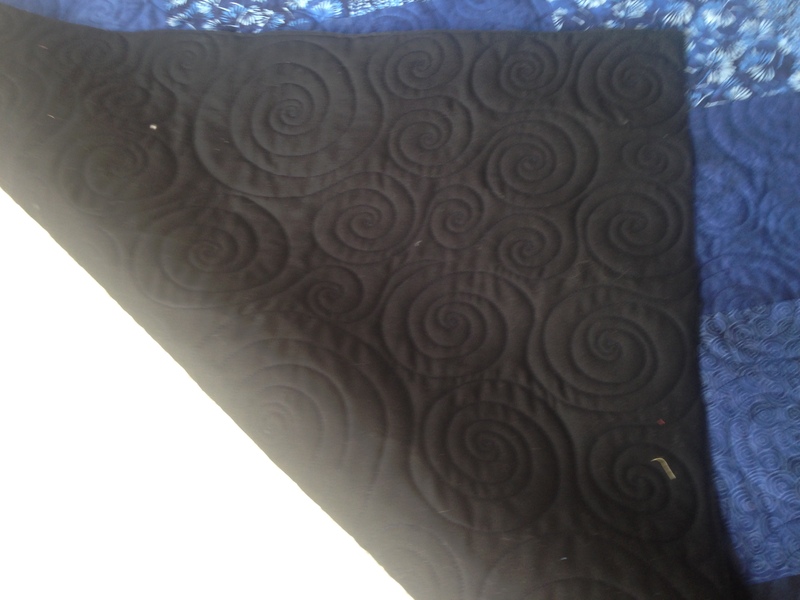 There can be other factors, such as timeframe (less time = less quilting), anticipated drape (highly quilted quilts are much stiffer), and quilt use intention (I often tell customers they may not want custom quilting on a gift for a 4 year old, it will get washed 100 times and they won’t know the difference). 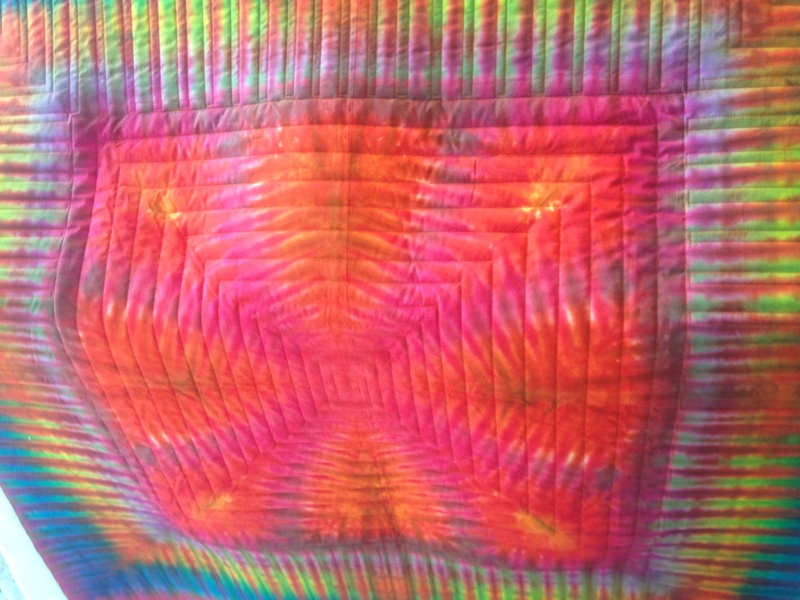 Regardless of the time it takes to come up with the perfect quilting pattern, it is highly rewarding to reach that light-bulb moment and then find that your conception has become a beautiful reality. 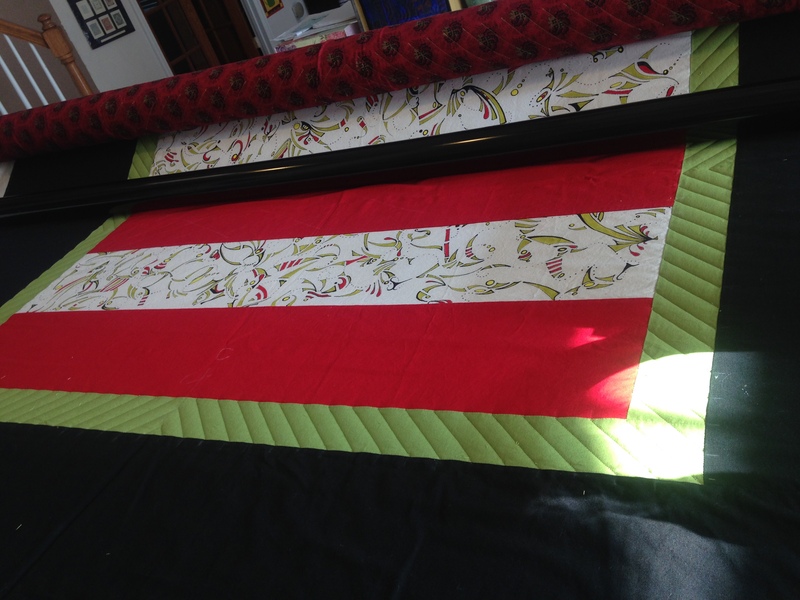 Happy quilting my friends! 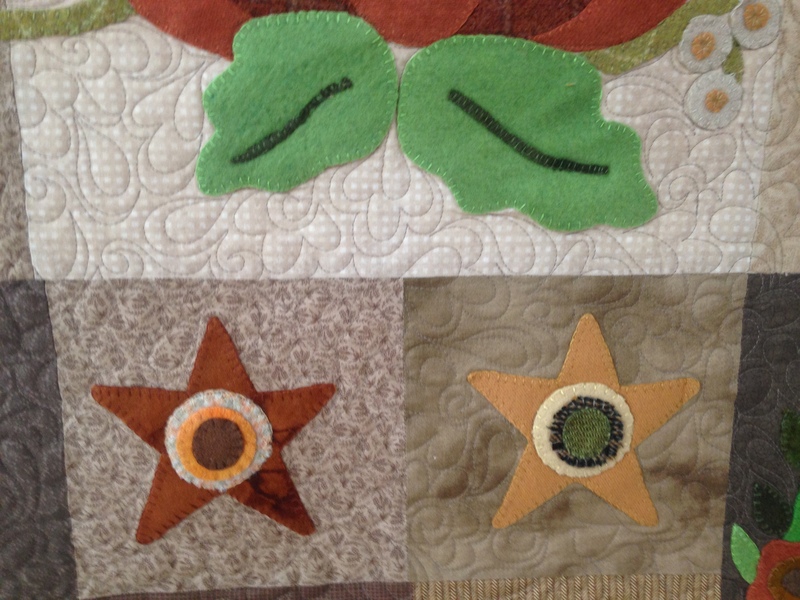 The last two quilts I have worked on have been custom jobs. 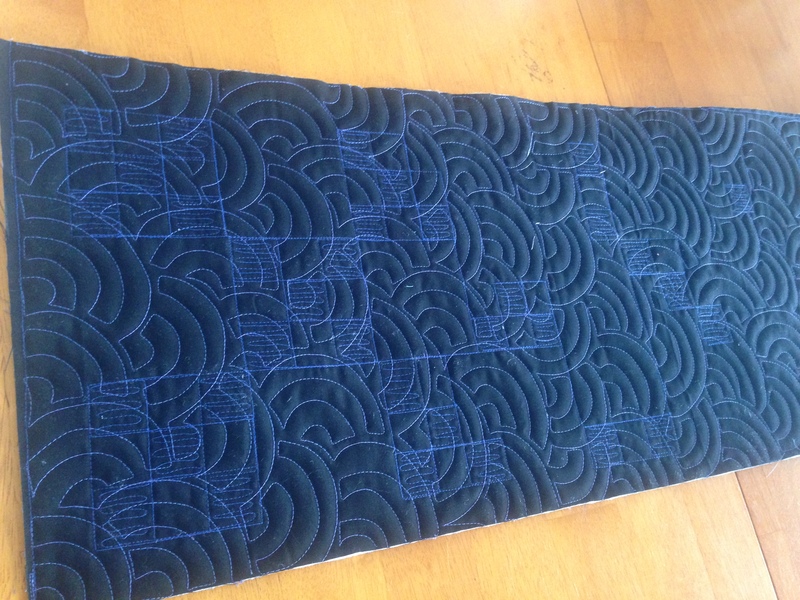 The last one was very exciting for me, as it was a small Judy Neimeyer pattern in turquoise and purple. 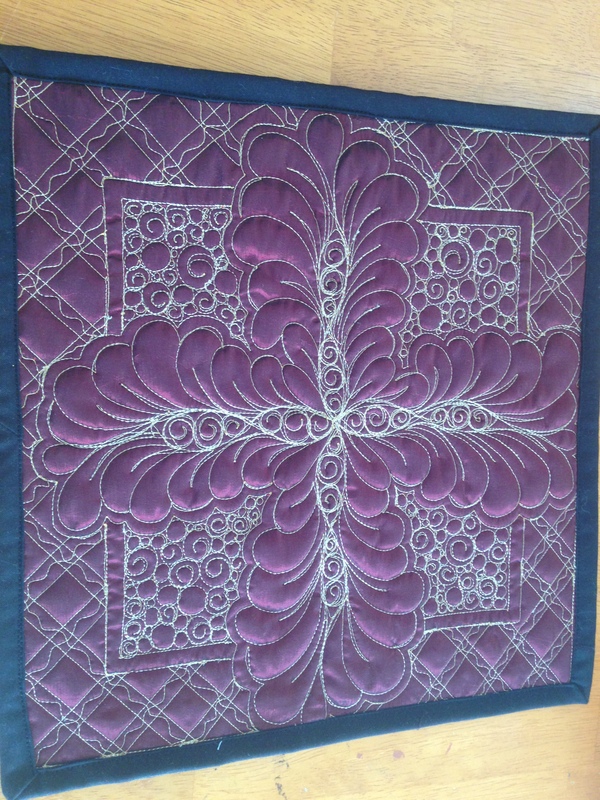 I have a ton of purple thread, and love to work with purple quilt fabric, but have not a stitch of purple in my house or wardrobe. Go figure. 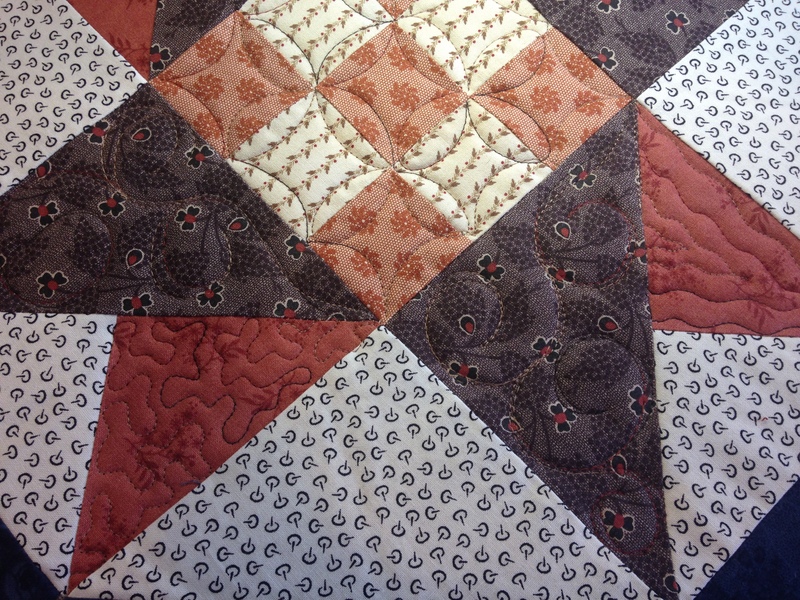 Anyway, now that the first project is complete, I am completely focused on this second quilt. 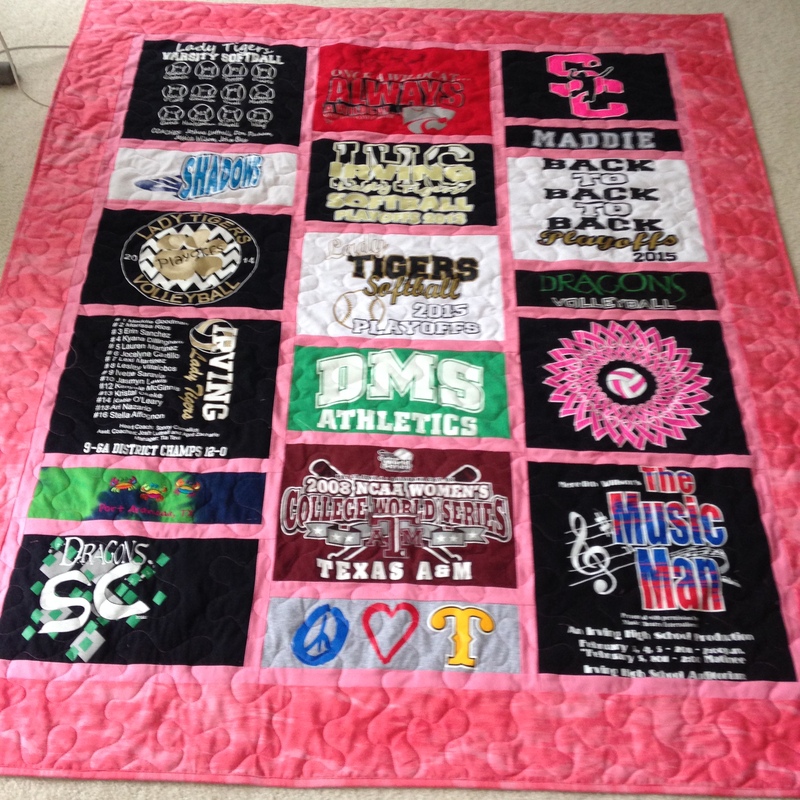 It’s huge – king size, alternating nine patch on point, desert colors with an appliqued border. 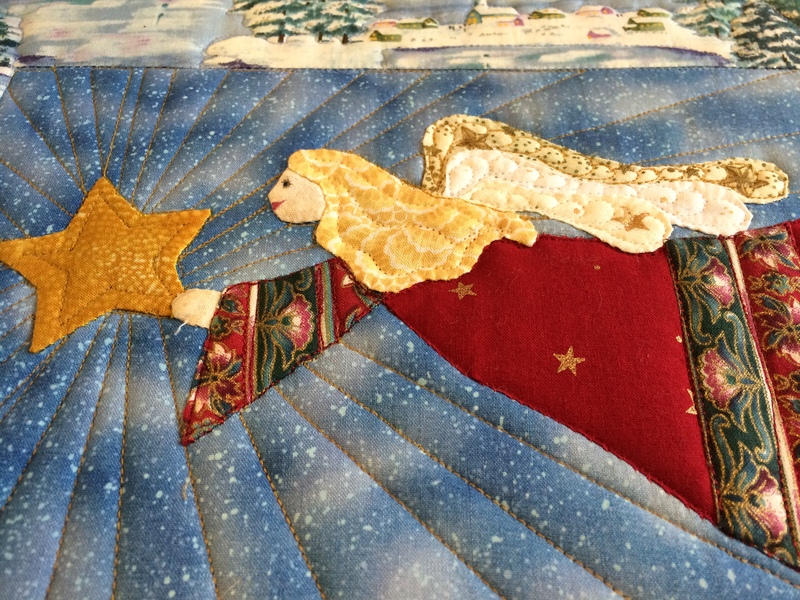 It’s beautiful, and it will be raffled by a quilt guild to raise funds. 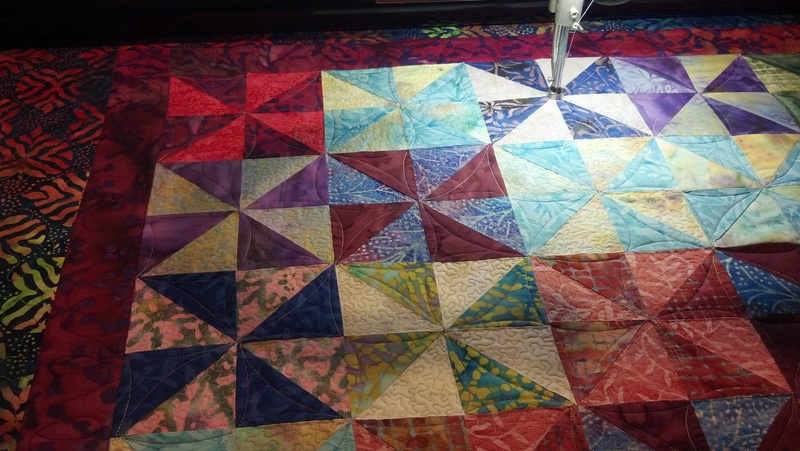 I am so pleased to be quilting it, but it is definitely a lot of work. 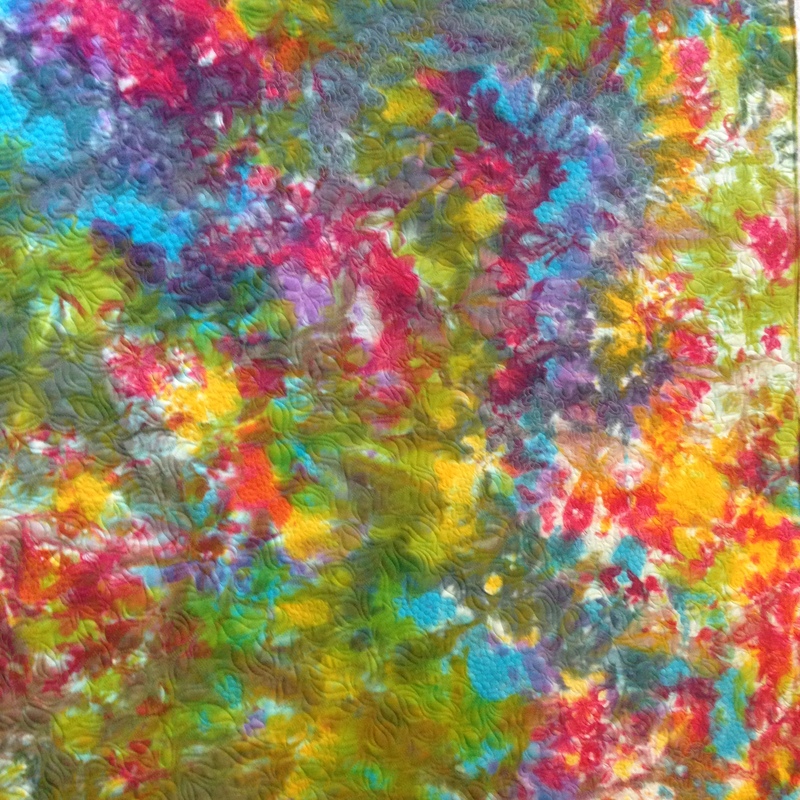 My original intention was to do something quite different than what is turning out. 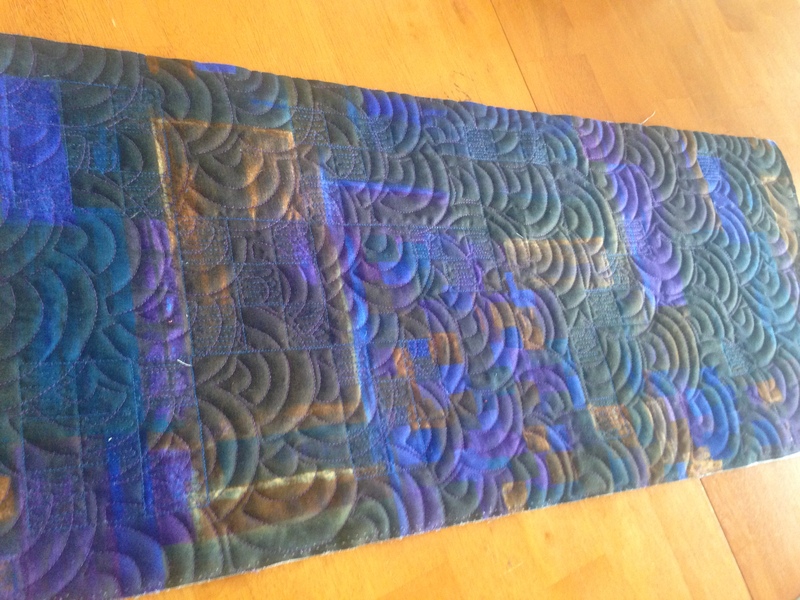 But much like the purple quilt, I wanted to really make the quilt have a texture to it, enunciated by the quilting. I knew what I was going to do in the borders and that I’ve done. But at this point, even after stitching in the ditch of every stinkin diagonal set block, I’m still not exactly sure what I’m going to do. Whatever it is, I’ll be doing it today. I did draw over the weekend, and came to a conclusion about what I wasn’t going to do, and what I think I want to do. But sometimes my best work is that spontaneous last minute decision, so we shall see! 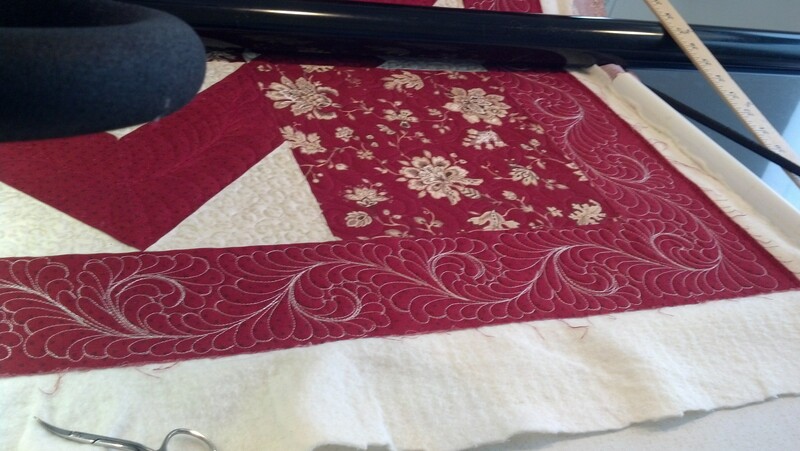 Whatever project you are working on, happy quilting my friends. Where have you BEEN?? 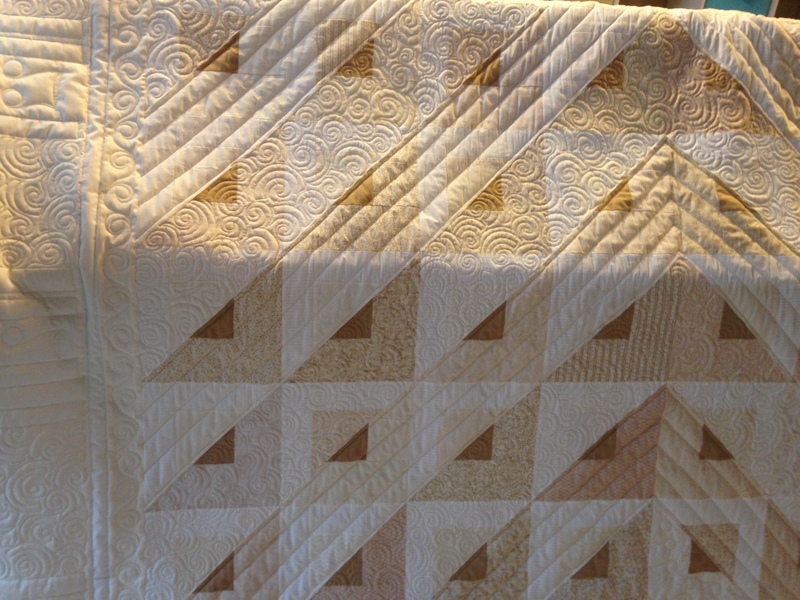 um… quilting? Well, lemme tell ya, I have been busy! I figure with that past two months’ work behind me, I should simply share my work and let you peruse. If you have questions, feel free to ask or post any comments of course. 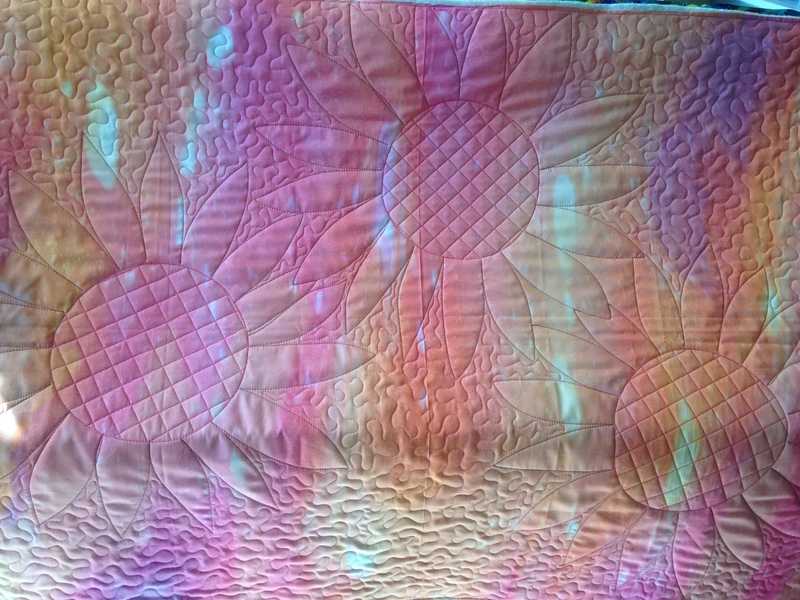 I can tell you I have had quite a few custom jobs, as well as some I didn’t even document because they were basic all over patterns that I repeated quilt after quilt. 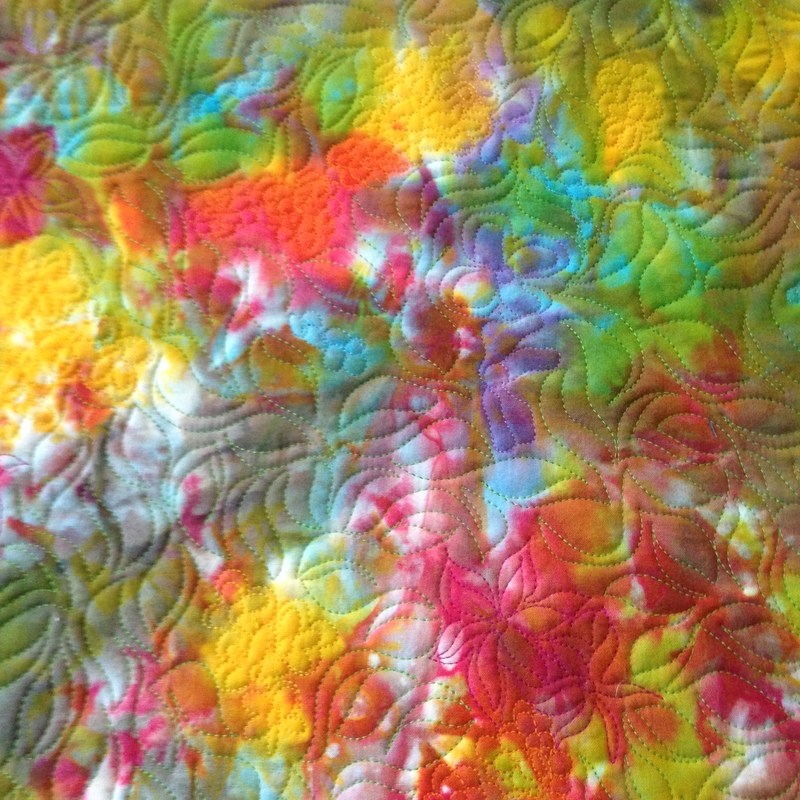 Some of these quilts I created from scratch and some I quilted. So enjoy this feast for the eyes! !